All prices include 4 Butlins passes 2 Adults & 2 Children (14years and under) . Extra passes can be purchased when booking holiday @ £50 per additional person. A £75 Bond is required on all bookings which will be refunded on inspection of van for damages.Quilts and pillows are included. If you require linen this can be arranged. A non refundable deposit at point of booking will be required to secure your holiday the balance is due 6 weeks before check in. If your holiday is less than 6 weeks away the payment in full is required to secure the booking. Adults breaks Bond is £150. and D.O.B of all occupants, if booking. Telephone Number of lead booker. PLEASE NOTE: Prices includes passes for 2 Adults and 2 Children, additional costs apply if more than 4 in group @ £50 per person. 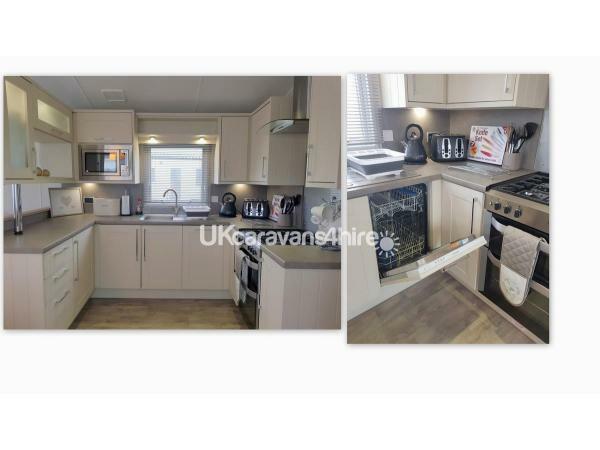 WILLERBY ASPEN LODGE 2018- RAND New for 2019 Season. 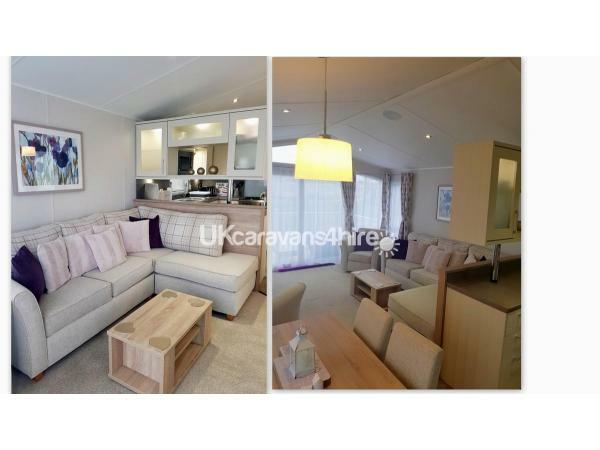 Our Willerby Aspen *LODGE* 2018 is graded 'Prestige' quite simply it exudes LUXURY and sophistication, guaranteeing a cozy stay whatever the time of year. 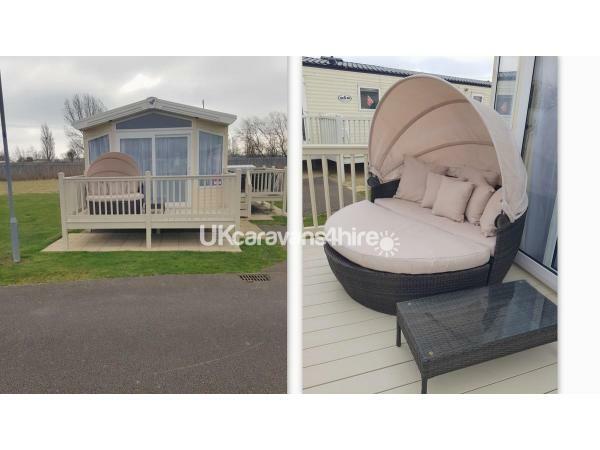 Our top of the range Luxurious Lodge in situated on 'The Retreat' of Butlins Caravan Holiday Village , just a few minutes walk away from the fabulous main entertainment. A secret escape style lodge, that will not disappoint. 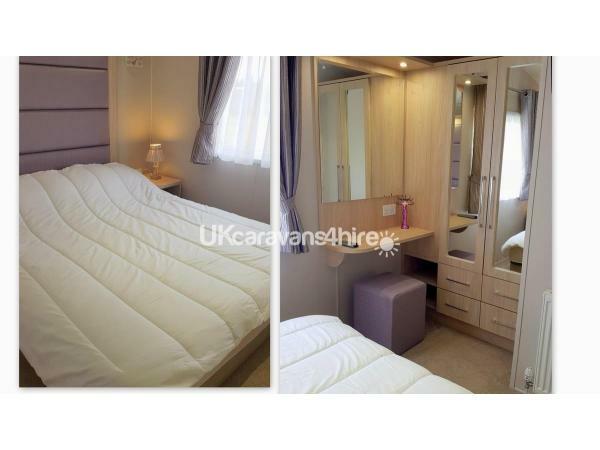 It is a fabulous 8 berth 3 bedroom, 2 bathroom, fully double glazed with central heating. 2 Verandas. It has Cathedral-Style windows with panoramic views, allowing acres of light to stream into the large sumptuous living room, a sliding patio door leads onto a large enclosed veranda, with under canopy lighting. The main living area has a relaxing corner sofa area, with built in Sofa-bed, two comfortable arm chairs (one swiveling) freestanding 40" curved SMART TV with SKY GO, (full package depending on internet speed) and of course Wifi is included, our sons games console (Xbox one) and controller' will be available to use (we ask you bring your own batteries)The lodge also has built in MP3 surround sound which works on blue tooth, Our dining area has 4 high back fabric covered chairs and 2 stools. Our contemporary SHAKER kitchen is fully equipped with everything needed to make breakfast, lunch and dinner plus a few snacks in between. 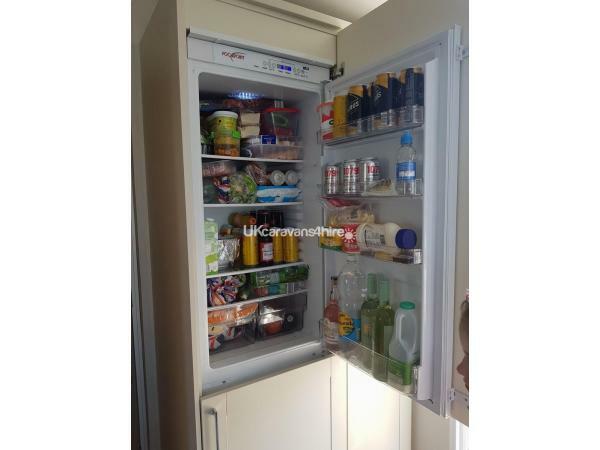 It has a built in gas cooker and hob, integrated 70/30 Fridge Freezer, integrated Combi microwave, kettle, toaster, cutlery and crockery, chopping board, glasses, mugs, pots and pans plus utensils, basically everything you might need if you choose to eat in. Don't worry Butlins also has pizza delivery!! Should you do all that cooking we have a fully integrated dishwasher to! The sleeping area is a touch above.. has a master bedroom like no other with its KING size bed, fitted wardrobe, with drawers, 2 bedside cabinets, and of course a dressing table quite simply there is loads of space to walk around!, its en suite large shower and toilet are also very spacious. 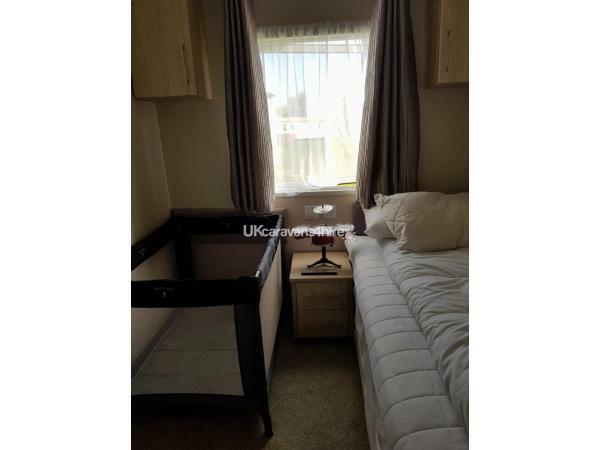 we then have 2 twin bedrooms,each with wardrobes, and the usual bedside tables with drawers, the added feature is they can be stored under each other so a travel cot can be put in its place! 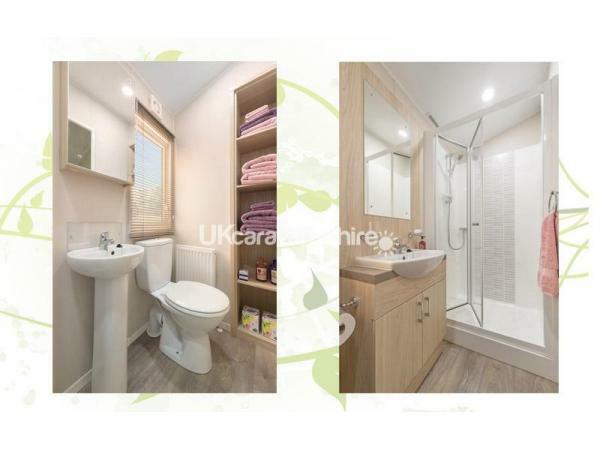 Down the corridor we have our main bathroom with a large shower, basin and toilet, plus shelving. 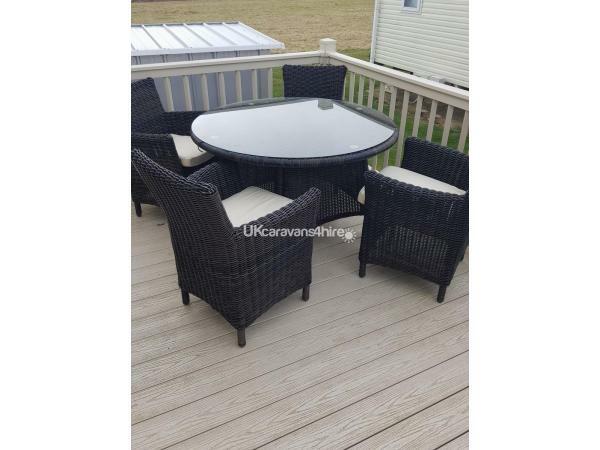 Rattan Daybed on front veranda, Rattan seating, table and parasol on side veranda. 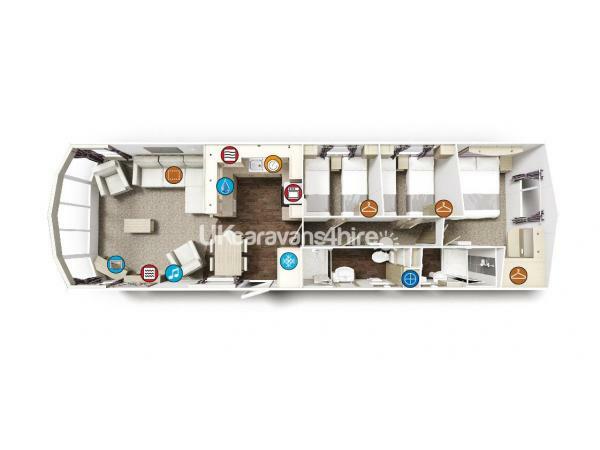 SAFETY: For your safety the caravan is fitted with a smoke alarms, carbon monoxide detectors and a fire extinguisher. 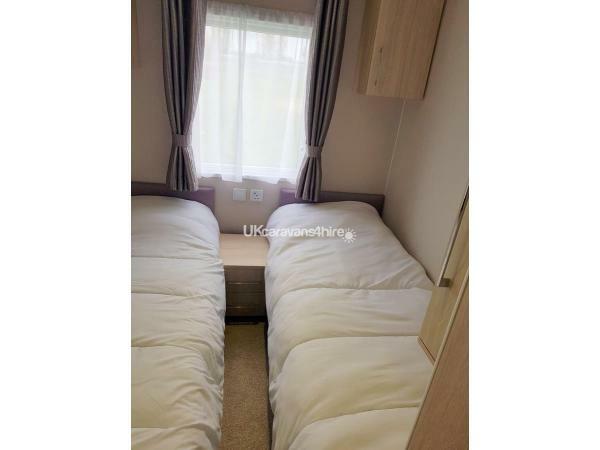 *Please note this is a privately owned caravan and smoking (including vapes) and pets are NOT permitted. We hope you enjoy your holiday and ask that you leave the van in the condition you found it. Please let me know if you have any problems and we will endeavor to rectify straight away, WE KINDLY ASK shoes be removed before walking on carpeted areas and children be supervised at all times when doing 'crafts' etc. Please leave the lodge as clean as when you arrived or the bond will be used to pay for cleaning. Accidental damages should be reported immediately and not hidden as inventory is checked after each booking. Optional extras chargeable: arcades, eateries including BurgerKing, climbing wall and bike hire, pool tables, snooker, darts, high wires, archery plus the beach within 5 mins, bars and children's climbing frames and much much more! I would highly recommend this beautiful caravan. It was absolutely immaculate and a real pleasure and a treat to stay in. We thoroughly enjoyed our stay. Excellent communication from the owners and booking experience was stress free. I was delighted to have found this.